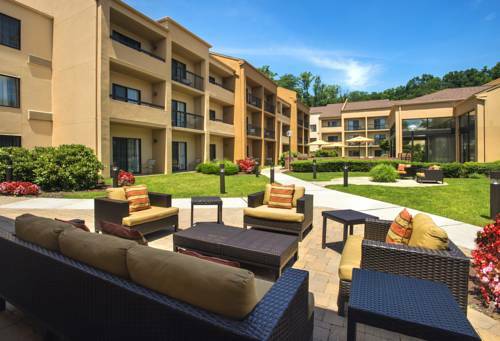 Let your worries wash away with a stay at Courtyard Tarrytown Greenburgh. Tucked away in Tarrytown, NY, our hotel is just 13 miles from the Westchester County Airport (HPN), 1 mile from the Metro North Tarrytown Train Station and 24 miles from New York City. We are also close to the Tappan Zee Bridge, the longest bridge in New York, which connects Tarrytown to other top destinations across the Hudson. Socialize in style when you spend some time in our state-of-the-art lobby or our beautifully landscaped outdoor patio, then dine at The Bistro, serving breakfast, dinner, specialty Starbucks beverages and evening cocktails. During downtime, work up a sweat at our on-site fitness center with cardio equipment and free weights, or cool down with a dip in the indoor swimming pool. At the end of the day, spread out in stylish accommodations complete with free Wi-Fi, luxurious bedding, mini-refrigerators and ergonomic work spaces. Make reservations today at one of the premier Tarrytown, NY hotels! Our Courtyard Tarrytown Hotel is your food and beverage destination for refreshing breakfast choices and a variety of dinner and cocktail options. The Bistro also offers specialty beverages made with Starbucks coffee to help you get a jump on the day. - Akzo Nobel Coatings Inc.